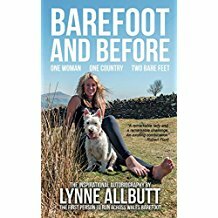 In 2014 Lynne became the first person to run the width of Wales barefoot and has since written her autobiography Barefoot and Before, which is available from Amazon. Far from being an ultra-runner or extreme sports woman, Lynne is a gardener with a passion for the outdoors and is often described as a Champion for Mother Nature. She is an avid writer and speaker whose humour and energy make for informative and lively walks, talks and interviews on topics including keeping pet pigs, bee-keeping (or bee-borrowing as she calls it), garden design, health and well being, mindfulness, Zoopharmacognosy (how animals self medicate in the wild and replicating remedies with oils) and of course, barefooting. Lynne pens a weekly full page column for Wales’s National newspaper, the Western Mail, also writing for The Tindle Group of Newspapers (The Abergavenny Chronicle) as well as regular freelance articles for a wide variety of magazines, websites and other publications. As well as being a regular guest on BBC Radio Wales, Lynne has vast experience in front of the camera, having presented a number of garden makeover shows for BBC Wales and Sky TV, plus other appearances including guesting on The Paul O Grady Show and as Derek Brockway’s walk guide for BBC’s Weatherman Walking (barefoot). A proud advocate for Wales, she readily pays respect and gives gratitude to the beautiful countryside for providing her profession, recreation and insights.